First Glasgow have launched 10 new ultra-low emission vehicles for their premium Glasgow Airport Express service as part of the on-going investment plans, which provides a 24/7 fast and frequent link from the city centre to the airport. The 10 new Enviro400 City double decker buses built by Alexander Dennis in Falkirk will double the capacity on these popular services. 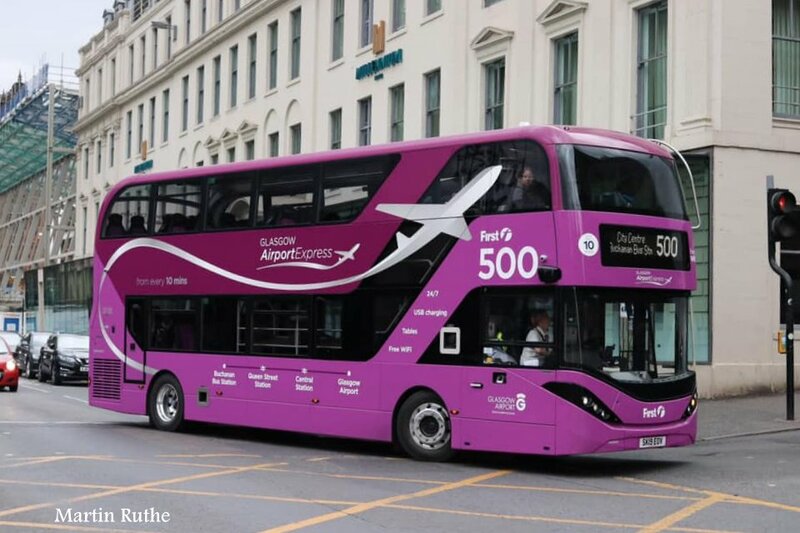 The new vehicles have been in operation on the 500 service from Sunday, April 14th serving one of the busiest airports in the UK. The buses come with luxury double padded seating, free 4G WIFI, USB charging points as well as new state-of-the-art wireless charging facilities on both the tables and seatbacks, luggage racks and most important of all, ultra-low emission Euro VI diesel engines. All 10 vehicles have also been fitted with the state-of-the-art SmartVision system, which replaces the traditional wing mirrors with a CCTV system fitted within the Driver’s cab to provide extra vision and safety. This system was originally trialled on the 75 services when the new vehicles were originally launched last October and now First Glasgow has extended the trial to all 10 of its Glasgow Airport Express service vehicles. The 500 service runs from Glasgow City Centre to the airport in as little as 15 minutes. This is one of the Glasgow operator’s most popular services carrying over 1.9 million passengers annually and an open return ticket on this frequent service is just £13.50, available on the First Bus App, when you plan your journey in advance. The new buses went on display to the public at a special launch event with Capital FM presenter Garry Spence entertaining the crowd at George Square in Glasgow city centre on Saturday, April 13th prior to the 10 new vehicles going into active service. The event saw First Glasgow bring summer to the city centre early with giant deck chairs, prize giveaways and exclusive offers to celebrate their launch. Glasgow Airport staff were in attendance to mark the launch of these new premium vehicles as part of their on-going partnership with First Glasgow, along with Visit Scotland and Alexander Dennis. Mark Johnston, Managing Director at Glasgow Airport, said: “We are proud to welcome this latest First Bus fleet into operation and I’m really impressed with the new ADL Enviro400 City model. “As well as vastly improving capacity, the double-deckers offer a number of fantastic customer experience enhancements. I’m sure our passengers who choose to sit in the upper deck level will also appreciate the elevated views these new models bring. Marie Connell, Business Development Manager at Alexander Dennis Limited, stated: “I supported the launch of the initial Enviro200 fleet on the Glasgow Airport Express route in 2015 and am delighted that we are taking our collaboration with First Glasgow on this popular route to a whole new level with these 10 new Enviro400 City. Glasgow’s largest operator has now invested over £30 million in a total of 150 new ultra-low emission vehicles for Glasgow since October 2018. This highlights First Glasgow’s continuing commitment to improving the quality of offering to its customers while at the same time playing its role in improving air quality in the city. Andrew Jarvis, Managing Director for First Glasgow, said: “It is exciting times for everyone at First Glasgow in being able to share these vehicles with the people of Glasgow and the rest of the world via our friends at Glasgow Airport. We have a great working relationship with the airport team and with these new state-of-the-art vehicles, we are providing their customers with a first-class experience on their journeys to and from the airport.